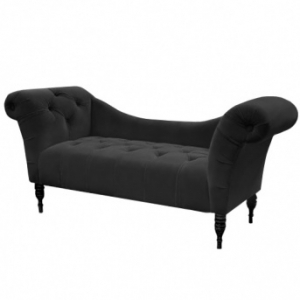 Now, I been wanting a similar styled couch as they Parisian Love Seat for quite a while now, but given the almost $700 price tag plus the cost of shipping; This wasn’t an item that I was too willing to splurge on for myself even though I really wanted it. However, I couldn’t find a similar looking product that I liked as much or that was considerably cheaper. I’ve gotten lucky with several items from Wakeupfrankie.com by waiting for sales, discounts and coupon codes that dropped the price of the item I wanted to a much more likable price - However, even after a few sales came and gone, this product’s price didn’t drop low enough for me to make the buy. money, as well as my dad chipping in. I always wanted a couch in my bedroom, but not like the regular sized, big couches that would take up a lot of space and this is perfect; Not only does it look great, but it’s also feels great. It’s extremely comfy to sit on, the bottom cushioned area as well as the back and sides as plush and the fabric is so smooth, just as velvet. Now, there is some assembly required with putting the feet of the love seat on the couch, but that was a piece of cake and took all of maybe five minutes to do with no hassle or having to supply any tools. Once put together, it was sturdy, sat perfectly on the carpet (And wood flooring) without wobbling or feeling as if it wasn’t secure. my bed. The low back doesn’t interfere from my view of the TV and the arms of the couch reach about the height of my bed so everything levels out nicely. This couch also sits a bit off the floor on its ‘feet’ which is great storage space for shoe boxes and things of that sort. This isn’t just a great item to look at, it’s actually functional too, and for the price of it, I would certainly hope so. of hair being left behind. It’s easy to clean, and after having it for quite a few months now, almost a year, I can say that it hasn’t lost a bit of softness since the day I got it and it’s just as comfy as ever. (Which you have to buy separably obviously) that’s available in the same colors, and cost just a bit less, which I would also love to have because it’s simply gorgeous. And there’s also a matching ottoman as well in the same colors that’s a bit cheaper, but still a bit pricey; However, if you can afford just one piece, or all three, I would definitely say go for it. I was hoping this product would live up to my expectations and that I would love it as much as I thought I would, and it does just that. I could say that I wish this would be a little cheaper, so maybe I’d be able to purchase another maybe in a different color in the future, but you really do get what you pay for and that’s great quality and a product that’s going to last you a long time - Wakeupfrankie.com has yet to disappoint me with any of their products, I would definitely recommend this.